Take control of your management skills development with one year access to this unique self-paced modular programme designed to respond to the needs and challenges of UN managers across the UN system, both at headquarters and field locations. The 2030 Agenda for Sustainable Development and the UN management reform call for UN managers to lead effective teams, implement changes and ultimately strengthen the UN’s capacities to achieve the 2030 Agenda. UNSSC puts you in control of your own learning, giving you access to a unique collection of management modules tailor-made for leaders and managers across the UN system. 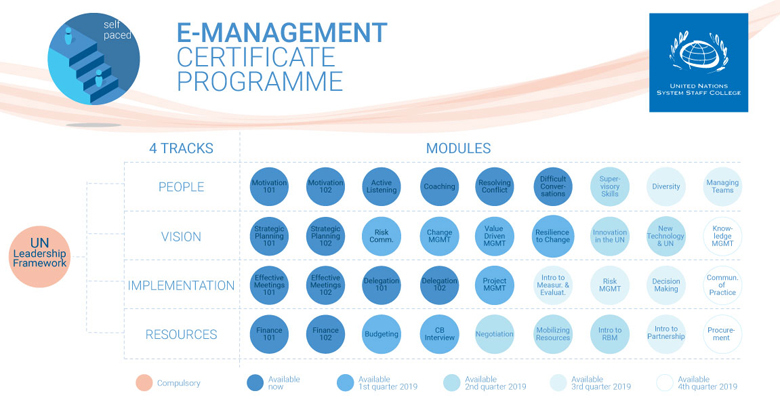 The curriculum includes a continuously growing collection of modules spanning across four different dimensions of management, including people management, planning, programme implementation and resource management. This programme follows learner-centered design & scenario-based learning. It is a self-paced learning path delivered entirely online. Participants can start at any time and complete modules and activities at their own pace and sign-up for upcoming new modules. Participants will be granted unlimited access to all modules for one calendar year from the date of enrolment. UNSSC dedicated e-learning platform tracks completion of individual modules. 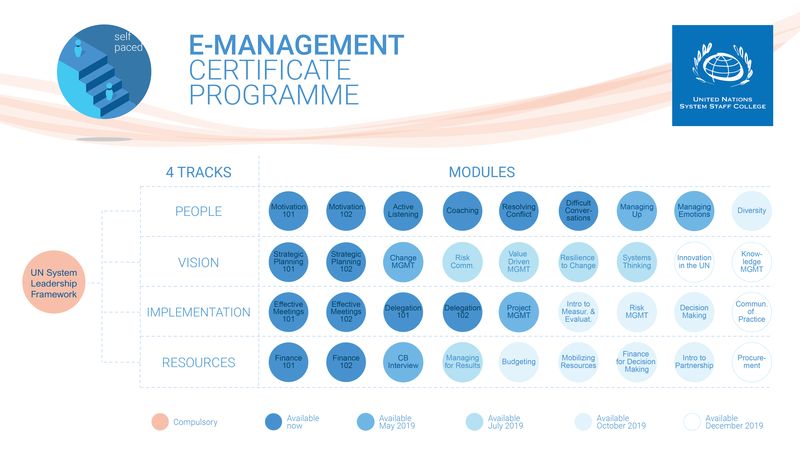 A final Management Certificate will be released to participants completing a total of 25 e-learning modules across all tracks. Each module is estimated to require approximately four to five hours of study time to complete at your own pace. People. This area includes modules on issues such as: Active Listening, Handling Difficult Conversations, Coaching Others Effectively, Resolving Conflicts and Motivating Yourself and Others. Resources. This area includes modules on issues such as budgeting and managing financial resources. Implementation. This area includes modules on issues such as: Leading Effective Meetings and Delegating Tasks. Vision. This area includes modules on issues such as Strategic Planning and Risk Communication. New modules on management-related issues will be periodically released and made available to registered participants throughout 2019. By completing the certification programme, participants will have access to an exclusive learning hub and alumni network for continuous learning around key management-related topics. UN officials at all levels with management and leadership functions at headquarters and in the field. The programme requires a tuition fee of 2,000 USD and includes access to all modules for one calendar year from the date of enrolment.